This is ABC South-West speaking. 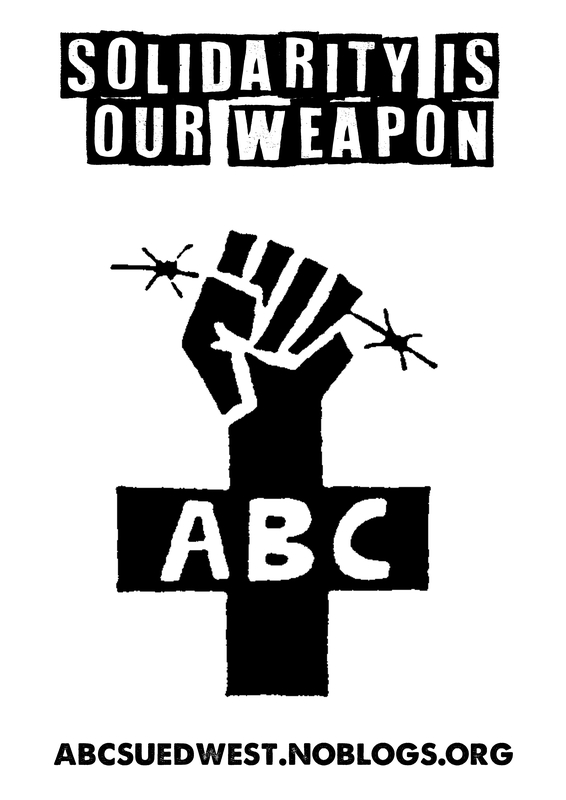 We would like to introduce ourselves as the newly-founded Anarchist Black Cross (ABC) group for Baden-Wuerttemberg, Germany and its surrounding areas. ABC’s goals are to show solidarity with prisoners and people suffering from repression, to connect those affected as well as solidary people and to offer support. This includes following and accompanying legal processes, so that cases of repression and violence are made public and nobody has to fight alone. In this context we will regularly post reports of ongoing court cases. We plan to create a list of prisoners in the region and – with your help – write letters to them, turning solidarity into action. The ABC seeks to offer information, discourse and networking for self-defense and self-empowerment. The website should act as an information platform where you can contribute texts and reports for publication, where a collection of helpful links and other material such as zines can be found, and where the framework for exchanging experiences is given. In time this will create an archive made up out of the collected contents, which can aid in observing and understanding developments in repressive structures as well as the corresponding possibilities to counteract them. In order to develop an overview of ongoing legal cases we are working on creating a chronicle of repression and solidarity. In order to do this we need your help ! Send us (encrypted) information on legal processes, police actions, prisoners, acts of solidarity and so on. The "Global" ended up in the title by accident. Sorry. We are a local decentralized group, not global of course.